Food service gloves will be provided, but please wear a hat. Thanks! 21may12:00 pm2:00 pmFeaturedAward Event - Register Today! Impact100 Metro Detroit Annual Award Event: We will listen to our nonprofit finalists and award a $135,000 grant! If you are a member and cannot attend, we will have absentee ballots available. This event is for members AND guests. It is FREE for members (it’s included in your membership fee). Guests are $35 per person, please invite friends, co-workers, and anyone else you can think of who wants to make an IMPACT – help us help more nonprofit heroes! Returning and new members will be able to renew or join at the event. About the event: Impact100 Metro Detroit awards high impact ($100,000+) grants to non-for-profits in the tri-county area. Organizations submit their proposals to our Grant Review and Financial Review committees. Applications are narrowed down to three finalists, each of whom presents their proposals at the Award Event. Members will vote to award a grant of $135,000 to the organization of their choice for 2019. Our vision: We will strive to continue year-over-year growth with the long term goal of awarding five $100,000 grants each year, one in each of our focus areas – health, education, arts, environment, and families and children. We’re fueling transformation through our local nonprofit heroes! Join your Impact100 Metro Detroit Board of Directors and fellow members for our annual meeting. Help us guide our chapter into the future with your input on important issues, meet your board, and get to know all the women who make up this active and exciting group working together to make a huge impact in our community. RSVP please by clicking HERE. Help determine the best organizations to receive our 2019 Grant Award! We are offering two training sessions for those who want to be a part of the action. Choose one that fits your schedule. To RSVP to either of these dates/times, please click HERE. Get Involved! Learn about our grant review process. Join a committee. Learn how we review our grant proposals. Help steer nonprofits through the process. Discover the amazing projects we can fund. Already served on a committee? Come for a refresher if you would like. 08jan6:00 pm8:30 pmThe Big Reveal! How much will we collectively give away in 2019? Join us on January 8 and be the first to know! The Impact100 Metro Detroit board will announce the size of our 2019 grant award and we will celebrate another year of awarding a truly impactful grant to an as-yet-to-be-determined nonprofit organization headquartered and serving in Metro Detroit. Celebrate with us at this members-only event and learn how you can be a part of the effort to narrow our applicant pool down to our finalists in preparation for our exciting Award Event in May! Great Food & Drink will be there too! Join us on Thursday evening, November 29, from 6 – 8 pm for our second annual meet, greet, shop and have fun event. Leon and LuLu’s, one of the area’s most unique shops, will host Impact100 Metro Detroit members, friends and anyone who might want to get a head start on their holiday shopping and learn about our great organization at the same time. This delightful FREE event, one of our biggest of 2017, will be better and even more fun in 2018. We will have great food, drink and entertainment!! Get it on your calendar today, and invite your friends! In addition to the fun, please help us keep others warm this winter. We will be collecting new hats, mittens and blankets for our 2018 grant finalist, Avalon Village in Detroit. Bring what you can, or buy something at the event (a portion of the proceeds will go to Impact100 Metro Detroit to help cover costs). RSVP today – you won’t want to miss this one. Bring ALL of your friends, too! Click HERE for our easy RSVP form. AND Our 2nd Annual MOON – Meet Our Outstanding Nonprofits! Impact100 Metro Detroit was formed in July, 2015 by a group of women who donate money and time to make a positive impact in Wayne, Oakland and Macomb counties. This simple yet powerful philanthropic model builds community through awarding grants to qualifying 501(c)(3) organizations. In 2018, we awarded a grant of $122,000 to Maggie’s Wigs For Kids. We work hard to also facilitate connections between our members and our nonprofits. To that end, members are invited to join us for this event. This workshop provides valuable information on grant writing strategy, gives specific information about Impact100 Metro Detroit’s application process, and is an excellent opportunity for continued networking among area nonprofits. If you know of another 501(c)(3) organization that may be interested in applying for our grant or in attending the workshop, please feel free to direct them to this website. RSVP no later than November 6 by clicking HERE. We look forward to seeing you! At Impact100 Metro Detroit, our Grant Award Winner visits are some of the most enjoyable events we host each year. Help us celebrate what our collective giving can do. Please RSVP by clicking HERE. Thanks! Impact100 Metro Detroit is pleased to offer our members (and their guests) a unique opportunity to sit down with people from the Center For Financial Planning and talk about how to include philanthropy in any investment strategy. Invite clients or friends to this event. All are welcome! To RSVP, click HERE. Hope to see you! Members and friends – join the Impact100 Metro Detroit Board of Directors for a fun and informational evening. Learn more about our group, meet new friends, find out how to get involved, ask questions, and get all the details on upcoming events. RSVP by clicking HERE. We look forward to seeing you! Impact100 Metro Detroit members celebrate the groundbreaking ceremony of our 2018 Grant Award Winner August 20, 2018. Our 2018 grant recipient, Wigs 4 Kids, is breaking ground on their new state-of-the-art facility. The new space promises to help them bring more and better programming and a medically healthier environment for the kids they serve. Help us celebrate with this great organization! Join us as we celebrate the graduation of the first group of students to complete the “Books Before Boxing” literacy program that was funded through our 2018 $100,000 grant award. Space is limited. Sign up today. Limited to the first 20 members who register. Please follow this LINK to register. Limited to the first 30 members. We’ve just awarded a high-impact $120,000 grant! Now it’s time to start again for our next grant cycle. Be a part of the amazing impact we can have as we CULTIVATE TRANSFORMATION TOGETHER!! What: Membership Kick Off Event – Happy Hour!! Why: Because We Can Make A Difference! Join us to learn about Impact100 Metro Detroit, meet members and friends, and see how you can help make a huge impact in our community. 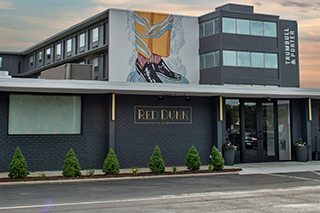 You won’t want to miss a visit to one of Detroit’s newest and most exciting restaurants. Come see us in Corktown and be a part of the action! Admission is FREE. Happy Hour prices in effect for drinks/food. 2018 Impact100 Metro Detroit $120,000 Grant Award Recipient. RSVP for yourself and a friend–or a table of friends! Click to Download the 2018 Award Event Invitation [PDF] to share for print or email. Members attend at no cost – this event is covered by your membership fee. Guests are $35 per person, and ALL are welcome. *Vegetarian or gluten-free meal option available. Each one, bring one! Make a greater impact and bring a friend or colleague so that they can share in this exceptional event. RSVP for the Award Event Today! CLICK HERE to our secure registration site. About the Event: Impact100 Metro Detroit (I100MD) Grant Review and Financial Review Committees have been hard at work reviewing our nonprofit applicants to narrow the list down to those who will present at the luncheon. The names of the finalists and summaries of their grant application will be available in advance of the event for your review. At the award luncheon, the finalists will present their proposed projects and each I100MD member will vote for the $120,000 grant recipient. Members, look for an email with the list of finalists in the next few weeks. Our Vision: To continue year-over-year growth with the long-term goal of awarding five $100,000 grants to nonprofits in five key areas: Health, Education, Arts, Environment, Families & Children. Every member helps us towards this goal. Keep Growing: Celebrate our impact in the community by renewing your membership before or at the event for an even greater impact in 2019! Share with a friend! Learn more about how women are cultivating transformation together in our community here. RSVP for the Award Event! 28apr9:30 am1:00 pmGather & Serve: Cass Community ServicesMake Serve lunch at Cass Community Services! Cass Community Services community — an opportunity interact with one of our past finalists! This is a great event for families with children to participate. Space is limited — RSVP Here today! 21mar5:30 pm7:15 pmGather and Serve at Honey for MomsOur Gather and Serve events are a terrific way to help, meet other Impact100 members and friends, and have fun! Announcing the first Gather and Serve event for 2018. In addition to awarding one or more high impact grants each year, Impact100 Metro Detroit continues to look for other ways to serve our community. Our Gather and Serve events are a terrific way to help, meet other Impact100 members and friends, and have fun! Helping the Empowerment Plan (2016 Grant Winner) by creating bags of toiletries for the homeless population they serve. Helping the Downtown Boxing Gym by creating “spring break survival” bags for their kids. During the school break, the children won’t be able to get the snacks, meals, or educational support they receive at the DBG. Enjoying some wine, cheese, and camaraderie as we help out!! Can’t come on the 21st? Help out ahead of time by donating some items. See what we need – click HERE. Join us for this terrific event. RSVP by clicking HERE. Are you interested in becoming more involved in the Impact100 Metro Detroit granting process? Do you have a financial background, or would you like to learn about how to read and evaluate financial statements? If you answered “yes” to any of these questions, then join our Financial Review Committee. We are offering two training sessions – come and meet fellow members and be a part of giving away $120,000! Financial review work begins March 27. The committee will meet a few times in early April. Dates to follow. Click below if you’re interested, and you will be contacted soon. RSVP HERE YES, I’m interested!! Are you interested in becoming more involved in the Impact100 Metro Detroit granting process? Do you have a financial background, or would you like to learn about how to read and evaluate financial statements? If you answered “yes” to any of these questions, then join our Financial Review Committee. We are offering two training sessions – come and meet fellow members and be a part of giving away $120,000!!! Any Impact100 Metro Detroit members who are interested in planning our chapter’s member engagement activities are welcome. Or, if you have ideas about recruiting or member communication you would like to contribute, you are welcome! Let us know you’re coming: Send an email to membership@impact100metrodetroit.org. All are welcome! Our 2018 Grant Cycle has begun! Be part of this rewarding process by joining the Impact100 Metro Detroit Grant Review Committee. Ready to get involved? Attend the grant review training! What you’ll need: Sections of this training will be hands on. Bring your tablet or laptop. Please RSVP on our new Event Registration system. It’s easy!! CLICK HERE. You will be directed to our registration form, after you register, you will be offered a chance to create a password to access our new Impact100 Metro Detroit membership web platform. You will be able to access your membership information to easily update your contact info, email preferences, and more!